Ron George: Female Cyclists : Not in Vogue? Female Cyclists : Not in Vogue? I have found reading about Jeannie Longo so fascinating that I had to devote a post on her. I first heard about her in the work, Tour de France - Three Weeks to Glory by Samuel Abt, now a poor, old and torn book lying on my bookshelf. Its a little unreasonable that women are excluded out of our daily coffee table cycling talk. We easily remember Lance and his super human feats, how Merckx took part in almost every event in the racing calender and possibly managed to win them all, about Anquetil's relentless French conquest of the early Tours, Levi's time trial prowess, boy Boonen's classic but surely rabid sprint wins, Cipo's flamboyance this, Bartali and Coppi's that ... and so on and so forth. And so when it comes to publicity campaigns,flashy magazine ads or even a subjective agreement on who the greatest cyclists are, its quite obvious to see that limitations are only to men. How about the other gender, possibly half of the 6 billion people on earth? Even if a .01% of them bike for a living, isn't that a substantial number? This abject attitude may be a sort of male chauvinism, an ignorance about others - possibly people from other cultures, or a feeling only men have the legs and the power, or a scarcity in media coverage (?) or a mix of little bit of everything. It may be true that cycling started with men, but the fairer one's jumped soon enough on the saddle, (no pun intended) and there's a celebrated following in the women's world of cycling, particularly with events such as the Grand Boucle of France, formerly the Tour Cycliste Feminin, a stage race akin to its male contemporary, the Tour de France. Its time to put all these mind boggling attitudes behind our seat tubes, in the slipstream of the rest of the junk in the air that may be ego or ignorance. Jeannie Longo Ciprelli, married to Patrice Ciprelli, her husband and her only trusted coach, started out in cycling after a career in competitive skiing. She was to dominate French cycling for the next two decades, opening her winning streak with the French Road Race championship at only 21 years of age. She finished on the podium at the Olympics 4 times, one of them being a stellar gold medal in the 1996 Women's Road Race. 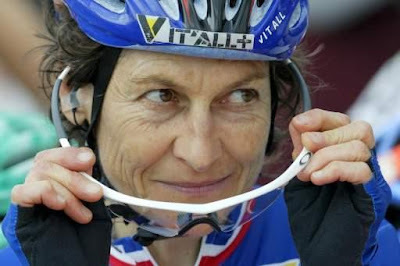 She has 12 UCI world championship titles, between the mid 1980's and 2001. 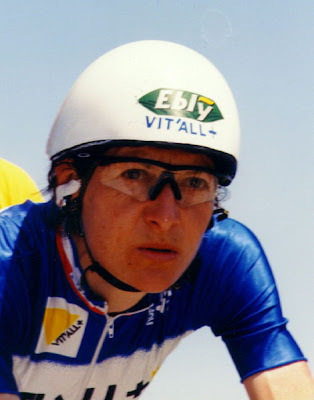 She was a UCI mountain bike champion in '93 and in 2000, set the hour record at 45.094 kms in Mexico. She was known as a fierce, sometimes feisty athlete. For many of her early career years, she feuded with French riders and cycling officials, dictating who her coaches and teammates should be. In her later world championships, Longo was not very close to any member of her team, which interestingly imposed a fine of 10 francs on anybody who would even mention her name at the communal dinner table! She trusted no one but her husband and coach, Patrice, and often eat and trained apart from the team. Jeannie made a hat-trick win out of the '87,88 and '89 Tours or GB's, smothering the competition. At the 1989 World Championships, she summed up her philosophy. "I learned from the Americans at the Olympic Games in '84," she said. "They always said, 'Go for it, go for the win.'" Go for the win is what Longo did for years with stunning and stultifying success. Somewhere in all this confusion of winning bike races, she also managed to get a Bachelor's in Math, an MBA and a doctorate in Sports Management. I respect cyclists. I respect educated cyclists even more!! It can be challenging to get a degree while you're doing something else like bike racing, let alone 3!! As of 2008, Longo is still an active racing cyclist although she races selectively. At age 49, the years may be catching up with her. She is placed 66th in the UCI women's rankings (when was the last time you saw a 48 year old male cyclist in the pro tour rankings?). There is also no information as to whether she will participate in the 2008 Beijing Olympics. But (correct me here) it does seem like no one has yet managed to take the title of reigning French national road and time trial champion from her. If it weren't for the financial and organizational difficulties of the Grand Boucle (GB), the event would have been as big as the Tour de France, with more sponsors, more competitors and a better media following. Unfortunately, these days the UCI rates the GB much lower when compared to other races. 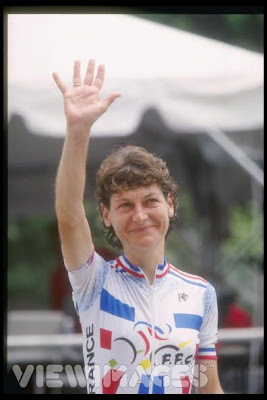 I think someone needs to step up and revive the women's Grand Tours, bringing it at par with men's events, before its well on its knees, and its stars long forgotten. That comes with a recognition that women have an equal potential to dream and achieve well. Sure, men can perform to physical heights that may be difficult for women, but I find it quite absurd that the women's cycling scene is clearly not in vogue. I think this could be a part of bicycle advocacy itself, what do you think? A silly prejudice I may have is the fact that there aren't that many female cycling bloggers around. Anyway, female readers are welcome to respond. Women haven't been given a fair shake in cycling. They train as hard as the men. The real issue with women's racing is the participation numbers. They just can't seem to get the numbers out to the races to force promoters to give them equal prize money and categories. I have read some about Longo. She truly was the best of her time and probably of all time. I agree that women are not given a fare shake. The poor attendance numbers are also due to the fact that race promoters don't typically pay the women riders as much as the men in prize money. I just took over the task of head promoter for a local crit and road race. As a race promoter my self (at a local level) I am working on getting women's race prizes to the same level as the men's. I won't get it done this season as funds simply will not be available in time but next year that is one of my goals. I think that will help out a lot. That says, hey ladies lets go race, we think your as good as the guys. I have just finished reading an excellent history of the Tour de France that looks at the social background of the race. To promote the event, the organizers were at pains to focust on the superhuman abilities of the riders. Women admired their manliness from the sidelines. And not much has changed. While living in Europe for four years, I think I was only able to catch a women's race once on television. No interest, no sponsors, no money. This is completely unfair as the women tend to ride shorter, more exciting stages--none of this cruising along and chatting for 130 km of a 220 km TdF stage. And a lot of the women cyclists look great and would be fitness role models for girls. On the other hand, Lance Armstrong never made as much money as Anna Kournikova.